For Pets up to 110 lbs. The Solvit HoundAbout II Large Pet Bicycle Trailer is a great way to maintain an active lifestyle with your pet. Leashing your pet to a bicycle can create safety concerns - the HoundAbout Trailer solves that problem and your pet will love the ride. It's also great for older pets or those with joint problems. The HoundAbout includes a unique axle design which lowers the cabin for easier access. 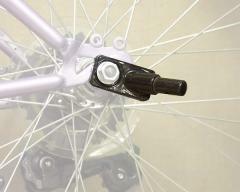 In addition, the hweel base is extra-wide for greater stability. 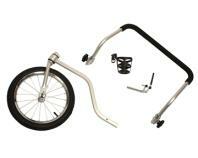 New for 2013, the frame is constructed from lightweight, rust-proof aluminum. The cabin material is a heavy-duty polyester material with waterproof floorboard. The front door on the trailer includes a zippered, mesh screen layer, and a zippered, vinyl layer to block wind and weather. Use them in different configurations depending on riding conditions. Pets load easily through the zippered, rear door, and they can stick their head out and enjoy the breeze through the roomy sunroof. Mulitple storage pockets hold lots of gear, including water bottle, personal effects, leash, treats, poopy bags, and more. The safety leash and removable, washable cushion keep pets secure and comfortable on long rids. The 20-inch air-filled tires provide a smooth ride and are off-road capable (nothing too extreme, please). The HoundAbout assembles quickly and can be folded down after use for easy storage. 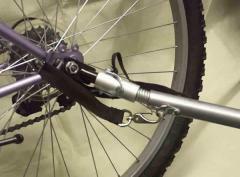 A universal bicycle hitch is included and extra hitches are available (sold separately). 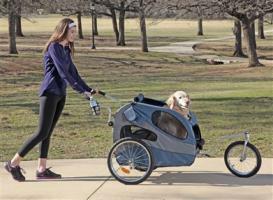 Want to go on a long walk or jog, but not sure your pet can make it all the way? Convert the HoundAbout Trailer into a stroller with our easy-to-install Stroller Conversion Kit - includes a handlebar, 12-inch swiveling wheel, parking brake, and cupholder. Converts from Trailer to Stroller and back in less than two minutes. The dimensions of the "cabin" on the Large Trailer are 33" x 22" x 26". When fully assembled, the overall trailer dimensions (including wheels and attachment arm) are 55" x 33" x 33" and it folds down to 34" x 23" x 9". With the stroller conversion kit attached, the full dimensions are 60" x 33" x 39" (the handle is 39" above ground). The wheels on the cabin are 20" and the wheel on the strolling kit is 16", and it is suitable for pets up to 110 lbs. 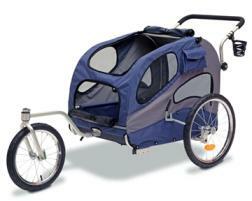 The trailer weighs 25 lbs and the stroller conversion kit add 8 lbs. Constructed from rugged 600d polyester with waterproof floorboard, on an aluminum frame. Features a front door with waterproof layer and mesh screen layer, a rear door with mesh screen; plus a sunroof. Mulitple pockets to hold water bottle, personal effects, plus leashes, treats, poopy bags, etc. "Cabin" dimensions = 33" x 22" x 26"
Full dimensions with wheels and towbar extended = 55" x 33" x 33"
Folds down to dimensions of 34" x 23" x 9"
Full dimensions with strolling kit attached = 60" x 33" x 39" (handle is 39" above the ground). Weight of trailer = 25 lbs; weight of stroller conversion kit = 8 lbs.